This chapter deals with methods to increase the amount of water stored in the soil profile by trapping or holding rain where it falls, or where there is some small movement as surface run-off. Schemes which are more concerned with catching and storing run-off for use later or at a distance from the storage are discussed in Chapter 6. The division of methods into these two types is arbitrary, so cross-reference signposts have been used liberally. There are also links with the efficiency of water use discussed in Section 4.2 on Biological Soil Conservation. Some writers have used the terms internal and external catchments. Internal catchments are where the run-off producing area is within the cropped area and are discussed in Chapter 5; external catchments are run-off areas outside the cropped area and are discussed in Chapter 6.
i. Where precipitation is less than crop requirements; here the strategy includes land treatment to increase run-off onto cropped areas, fallowing for water conservation, and the use of drought- tolerant crops with suitable management practices. ii. Where precipitation is equal to crop requirements; here the strategy is local conservation of precipitation, maximizing storage within the soil profile, and storage of excess run-off for subsequent use. iii. Where precipitation is in excess of crop requirements; in this case the strategies are to reduce rainfall erosion, to drain surplus run-off and store it for subsequent use. The weakness of this approach is that the main feature of rainfall in semi-arid regions is that it is very erratic and completely unpredic- table. There can be wide variations of moisture shortage and surplus, both within and between seasons. A drought year whose total rain is well below the long-term average may still include periods of excessive rain and flooding, while a high rainfall season may include periods of drought. This makes the choice of method difficult, because the desired objective may change from one season to another. In a dry area it may be sensible to increase surface storage to improve crop yield in most years, but in a wet year this could cause waterlogging and reduce the yield. On the other hand, a drainage system may have the objective of increasing the run-off but also have the undesired effect of exaggerating the effect of a drought. It is therefore not practical either to classify methods according to average conditions, or to design strategies based on averages. The art or science of water management is to reduce the problems caused by non- average events of flood and drought. Sometimes it may be passible to have dual purpose methods which can be changed mid-season, for example by opening up the ends of contour bunds to shed surplus water after a wet start to the season, or to block outlets for the opposite effect. But not many methods allow this flexibility, and we showed in Section 2.3.1 that little progress has been made in developing methods of predicting the later part of the season on the basis of the earlier part. In addition to the vagaries of rainfall, there are a host of other variables, the soil, the land use, the farming system, and the social patterns. Throughout the semi-arid regions of the world there is a wide range of indigenous systems and methods, but experience has shown that they do not always transfer well from one set of conditions to another. In a good discussion of this subject, Pacey (1985 Chapter 6) points out that apart from the technical differences, methods must also be compatible with local life styles, social systems, and patterns of administration. Transferring what appear to be simple techniques requires not only the dissemination of information but also the adaptation to local conditions. In this Bulletin, when presenting information on available methods, we have not tried to prescribe a detailed treatment for a particular problem, but rather to set up a large array of possible methods, from which the person on the spot can choose methods to test locally. When choosing a method or technique we must be aware of the physical and personal difficulties. Because of the variable rainfall we must expect a low success rate. The odds will be slightly better for grass, trees, and shrubs than for grain crops which are more demanding in their moisture requirements. They need rain at the beginning of the growing season, then a number of storms big enough to generate run-off and at reasonably regular intervals, since run-off events too close together will be wasted if they exceed the storage. The soil must therefore have sufficient soil moisture storage capacity to keep the crop growing between run-off events. There will often be difficulties in keeping stock away from improved areas. Wire fencing is expensive, live hedges need time and care to establish them, and thorn hedges need regular maintenance. Maintenance is also required on any structural works like banks or furrows. Personal constraints are that people naturally do not like to put a lot of effort into schemes which have a low success rate, nor if their tenure is insecure. In dry areas the people are frequently mobile or partly nomadic and so may not live permanently near sites suitable for run-off schemes. There are many former schemes which are now abandoned, and knowing more about the reasons would help us plan new schemes. The term "rainfall multipliers" describes methods where the run-off from an uncultivated part of the land is diverted on to a cultivated part, thus giving it the benefit of more water than it receives directly as rain, hence rainfall multiplier. · Efficiency reflects the difference between rainfall distribution and the water requirements of the crop. Schemes with internal catchments require high energy inputs for surface modification and so tend to be more common on crop land and in areas with annual rainfall of 250 mm or more. The ratio of catchment area to cultivated area is likely to be from 1:1 to 5:1. Schemes using external catchments may have much higher ratios, for example up to 30:1 in the case of the run-off farming in the Negev desert (Evenari et al. 1982). Such systems may be practical at levels of rainfall down to less than 100 mm, which is lower than is possible for in-field schemes for cropland. The run-on is greater in b), so the soil moisture storage must be greater, or run-off events better distributed. In developed economies it is reasonable to look at the long-term returns from schemes which require investment, but this is less helpful in semi-arid areas. Even when long-term rainfall records are available, and probabilities can be calculated, subsistence farmers or nomadic pastora- lists work to very short-term plans. Several examples are reported from Kenya by Finkel (1984) when soundly planned schemes were abandoned after poor results in the first year to two. 3-10 ha 4-10 " " "
300-500 ha 1 " " "
Procedures for estimating rate and amount of run-off are given in Hudson (1981) and FAO (1981). The techniques described in this section all involve some re-shaping of the soil surface, and so require substantial inputs of energy. In many cases it is not practical to use only hand labour, and animal-drawn imple- ments are necessary, or tractors. Some of the methods show promise of increased crop yields so a major feature of experimental trials is the search for cheap, simple, low energy methods and machines. Figure 5.1 shows the main features of the methods described in this Section. 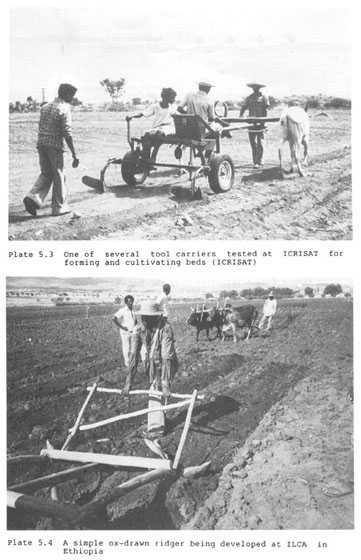 The Broad Bed and Furrow system has been mainly developed at the International Crops Research Institute for the Semi-arid Tropics (ICRISAT) in India (Krantz 1981, Pathak et al. 1985). A comprehensive research programme was carried out on-station for eight years before being taken for on-farm adaptive research at Tadthanapalle in Medac district (ICRISAT Annual Reports 1975-1984). It is a modern version of the very old concept of encouraging controlled surface drainage by forming the soil surface into beds. In medieval times in Britain this was used for improving pastures and called "rigg and furrow"; it has also been used in North America (Phillips 1963) and in Central Africa (Cormack 1954). A variation known as the camber-bed system was used in Kenya (Robinson et al. 1955). An experimental layout at ICRISAT is shown in Plate 5.1 and the bed cross-section in Plate 5.2. The recommended ICRISAT system consists of broad beds about 100 cm wide separated by sunken furrows about 50 cm wide. The preferred slope along the furrow is between 0.4 and 0.8 percent on vertisols. Two, three, or four rows of crop can be grown on the broad bed, and the bed width and crop geometry can be varied to suit the cultivation and planting equipment. Some examples are shown in Figure 5.2. In India the system has been used mainly on deep vertisols (heavy black clay soils sometimes called cotton soils); wide beds are used on a gentle grade and they are formed by ox-drawn wheeled tool carriers (Plate 5.3). 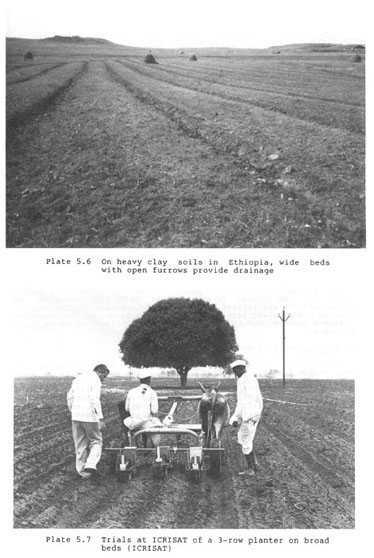 There are extensions of this work on similar soils in Ethiopia (ILCA 1985) with an interesting development of a very simple ridging implement shown in Plate 5.4. 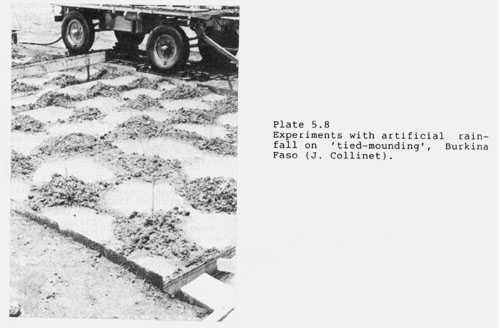 Another variation using smaller ridges is being developed by the Agricultural Research Centre for the Semi-arid Tropics (CPATSA) of the Brazilian Enterprise for Agricultural Research (EMBRAPA) located at Petrolina, Brazil (Lal 1985 and 1986); it is illustrated in Plate 5.18.
i. to encourage moisture storage in the soil profile. Deep vertisols may have soil moisture storage up to 250 mm, which is sufficient to support plants through mid-season or late-season spells of drought. The possibility is also increased of double cropping by means of inter-cropping or sequential cropping. The large water storage capacity of the soil supports growth more easily during the subsequent dry but cooler post-rainy season. ii. to dispose safely of surplus surface run-off without causing erosion. Plate 5.5 shows the flooding which can occur on vertisols. iii. to provide a better drained and more easily cultivated soil in the beds. There is only a narrow range of moisture conditions during which the soil can be efficiently tilled or planted, and timeliness is a key factor. Only about 20 percent of the deep vertisols in India are cropped during the rains, mainly because of poor workability when wet. The situation is similar in Ethiopia (Plate 5.6). If a crop can be established during the early rains, the profile is usually near saturation only for short periods during the latter half of the season, water is more efficiently utilized, and there is less need for run-off collection and storage. The possibility is also increased of double cropping by means of inter-cropping or sequential cropping (Kampen 1979 and 1981). Tillage of the raised beds may be possible before the rains, introducing the possibility of dry seeding ahead of the rains in areas where the start of the rainy season is fairly reliable, and there is a good chance of follow-up rains to ensure the establishment of the germinating crop. The difficulty of preparing a seed bed during the dry season in these hard clay soils has been greatly improved by the use of broad beds and animal-drawn equipment. iv. the possibility of the re-use of run-off stored in small tanks (Plate 5.1). Small amounts of life-saving irrigation applications can be very effective in dry spells during the rains, particularly on soils with lower storage capacity than the deep vertisols. The BBF system is particularly suitable for the vertisols. The technique works best on deep black soils in areas with dependable rainfall averaging 750 mm or more. It has not been as productive in areas of less dependable rainfall, or on alfisols or shallower black soils - although in the latter cases more productivity is achieved than with traditional farm- ing methods. Other methods, with more emphasis on storage and irrigation within a package which includes BBF, are more likely to be viable for the alfisols (Ryan et al. 1979). It is also stressed throughout the ICRISAT research that the BBF system should not be considered in isolation, but only as part of an improved farming systems package. An important component of the system is an ox-drawn wheeled tool bar, which can be used with ridgers to form the raised bed and also later for carrying precision seeders or planters (Plate 5.7). The tool carrier is thus used for the initial forming of the beds, the subsequent annual reshaping, and for all tillage, planting, and inter-row cultivation. Even the cost of the simplest factory made tool bar is beyond the resources of most peasant farmers, but the really cheap wooden ridger shown in Plate 5.4 shows promise. This method is also known in the USA as furrow blocking, furrow damming, furrow diking, and basin listing. 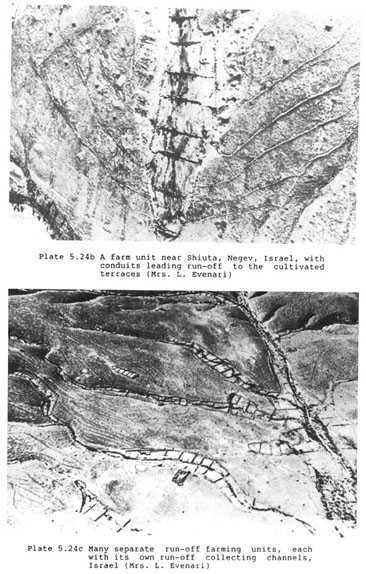 The principle is to increase surface storage by first making ridges and furrows, then damming the furrows with small mounds, or ties (see Plate 4.14). Graded ridges alone will usually lead to an increase of surface run-off compared with flat planting, while tied ridges will decrease the run-off and increase the storage. In different seasons either of these two effects may be prefer- able. And so the design question is when to go for drainage and when for storage. An aid to designing what is best in the long-term by modelling has been developed (Morin et al. 1984), but designing the system which will give the best effect in the long term will not prevent the system giving the opposite effect from that which is required in a particular season. The possibility has been suggested by Ahn (1977) of hedging the bet by tying alternate furrows. This is not a very satisfactory solution. One argument is that this would reduce the amount of damage by too much run-off or too much retention, but one could equally well argue that it will ensure that half of the land will always be under the wrong treatment. An interesting possibility is to use tied ridging in connection with sprinkler irrigation to allow higher application rates at low pressure (Stuart et al. 1981). Tied ridging is usually associated with mechanized farming. There have been some attempts at achieving it with ox-drawn implements, but the system really needs high draught for speed and preci- sion, which is required if the ridges are to be re-ridged or split in subsequent years. Either ridging alone or tied ridging has occasionally been practised using hand labour, but the high labour requirement usually makes this unpopular with subsistence farmers. Anyway hand-made ridges are usually less efficient. They are more likely to depart from a true contour and to have variations in the height of the ridge, both of which will increase the risk of overtopping. A variation in the theme, which is suitable for hand work, has been tried on a limited scale in Burkina Faso and is called tied-mounding shown in Plate 5.8. There is an extensive literature reporting trials of tied ridging in many countries. A few of the reports indicate problems and failures but the great majority claim such outstanding success for the system that one wonders why the system has not been more widely used. A possible solution to this conundrum may be that the inconsistency, and unreliability of good results, prevents it becoming more widely adopted. "Under certain circumstances the system has been beneficial not only for reducing run-off and soil loss, but also for increasing crop yield (Lawes 1961, 1963; El-Swaify 1983; Dagg and McCartney 1968). However, during high rainfall years or in years when relatively long periods within the rainy season are very wet, significantly lower yields were reported from systems with tied ridges than from graded systems which disallowed surface ponding ef water (Lawes 1963; Dagg and McCartney 1968). Under such conditions tied ridging enhanced waterlogging, developed anaerobic conditions in the rooting zone, excessive fertilizer leaching, and water table rise in lower slope areas." "Similarly on a sandy soil at Lusitu in the Zambesi valley, tied ridges increased mean crop yields (maize, sorghum, and millet) over those on flat land by 168, 159 and 16 percent under seasonal rain- falls of 587, 623, and 724 mm (Honish, 1973); and on vertisols at Big Bend, Swaziland, mean increases for maize, cotton, and sorghum were 64 percent in a year of 508 mm, and 308 percent in a year of 310 mm (Warwick 1979, 1980). Clearly responses can be dramatic, but recent work under very harsh conditions in Botswana has shown that there may be also negative effects. Higher soil temperatures within the ridge can be detrimental to seed germination, and where showers are light the penetration of moisture into the soil may be shallower than that in the flat soil (DLFRS, 1984)." Another report from Botswana indicates a positive response to sorghum yields from tied ridging in both a very dry season (1972/73) and a very much wetter one (1973/74) (DLFRS, 1973; 1974). In the Negev desert in Israel, Rawitz et al. (1983) reported that tied ridging greatly increased the effi- ciency of a fallow before cotton, but that when the system was tried for wheat crops it was less successful because of waterlogging in the basins (Plate 5.9). The use of wide beds with untied furrows was therefore pre- ferred and gave increased yields, but the climate of the Negev is special since it has winter rainfall and a very low mean annual rainfall. From India also, broad ridges gave better yields of sorghum than either flat planting or narrow ridges(ICRISAT 1976) and a similar result was reported for sorghum and castor in Gujarat by Brahmbatt and Patel (1983). In Texas, USA, Clark and Jones (1981) reported substantial increases in sorghum yield from 1420 kg/ha to 1650 kg/ha for tied ridging compared with flat planting. 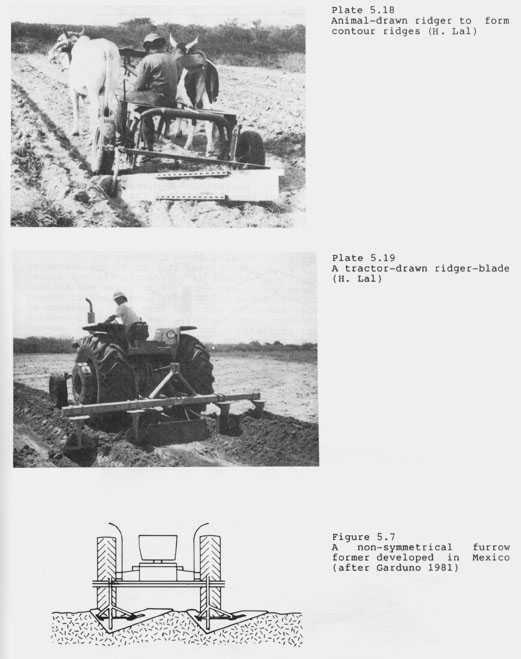 In another American study in Texas diked furrows were found to be effective at holding and absorbing high intensity storms (Billbro and Hudspeth 1979). Similar successful applications of tied ridging in the Great Plains of the USA are also reported by Stuart et al. (1985), and again one is inclined to wonder why, in the face of so much positive experimental evidence, one does not find the whole of Texas and the whole of Tanzania covered with tied ridging. One possible reason for the low adoption of the system is the temperature effect reported by Jones. Another is the danger of waterlogging in wet years. This can be worsened when there is compaction of the furrow bottom by tractor traffic, and one must also consider whether the machinery and implements are as efficient as the reports would suggest. There is a danger of soil erosion if the ridges are overtopped and break so that the water temporarily stored in the depressions is suddenly released. This will not happen if the combination of surface storage plus the amount which infiltrates into the soil surface is less than the storm rainfall. This implies a high value of soil storage, usually deep soils with good infiltration and permeability. In some systems the infiltration is increased either by mulching in the furrow bottoms or by subsoiling or cultivating. · there should be a back-up system of conventional graded channel terraces to prevent damage if the ridges do overtop or fail. · intermittent hydraulic lift either manual or triggered by rotation of tractor wheels. The design of implements in the USA is described by Lyle and Dixon (1977), and in the USSR by Tregubov (1981). An earlier review by Boa is useful but out of print (FAO 1966). 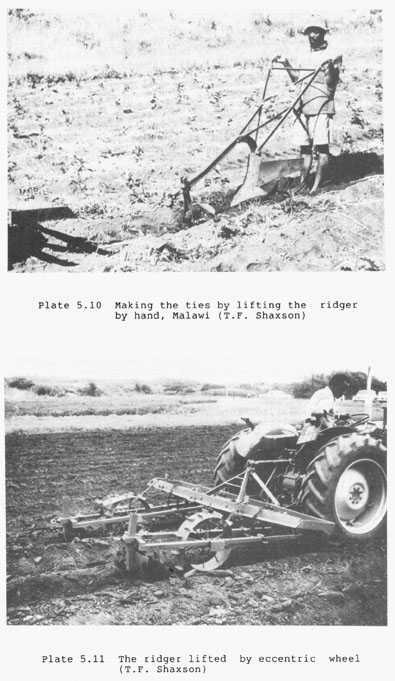 The construction of tied ridges is mainly associated with mechanized farming because of the high labour requirement, but it is quite possible to do it by hand labour. 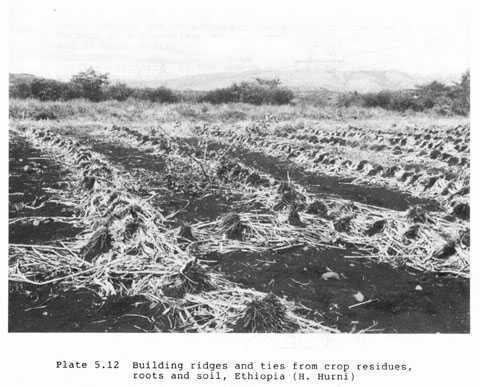 Plate 5.12 shows an example from Ethiopia where the ridges and ties are made by piling up lines of sorghum residues and roots and soil. This is another type of rainfall multiplier, using part of the land surface as a catchment to provide additional run-off onto level terraces on which crops are grown. The method is particularly appropriate for large- scale mechanized farming such as the wheat/sorghum farmlands of the south- west of the USA, where the method was pioneered by Austin W. Zingg in 1955. Experimental results were first reported in 1959 (Zingg and Hauser) and after detailed studies at Bushlands Experiment Station in Texas, and Hayes in Kansas, a technical and economic evaluation was made by Hauser and Cox (1962). This led to extensive trials in the six western States with low rainfall, and these were reported in detail (ASAE 1968). CBTs were compared with the conventional practice of level terraces (i.e. level along the length, but the original slope is left between terraces), and also with all over bench terracing (Figure 5.3). There is a soil erosion hazard during high-intensity summer storms, but CBTs were as effective at controlling erosion as the other two practices, and more effective at reducing the overall run-off. The data from these trials provided general guidelines on the method, but standard designs should be avoided because of the wide variation in conditions of soil, rainfall and farming system. The best way of applying the system in a particular situation should always be investi- gated locally. · Gentle slopes of 0.5 - 1.5 percent are most suitable although the system has been used up to 6 percent in North Dakota. As with all terracing, a steeper slope requires more earth moving. · A deep soil is required, both to provide sufficient soil moisture storage, and also to lessen the effect of cutting during the con- struction of the terraces. Several USA workers report a reduction of yield from the disturbance of the soil during terracing for up to six years. Some even went to the length of stockpiling the topsoil and replacing it after levelling. Good permeability is also required so that the contained flood water can be absorbed quickly. · Smooth slopes are an advantage where large mechanized farming can be made more convenient by constructing all the terraces parallel and of equal width. · Precise levelling of the bench terrace is important to ensure uniform build up of soil moisture. · If there is a risk that run-off from the catchment area will be greater than can be absorbed and stored on the terrace, there must be outlets at the ends of the terrace, which can discharge into grass waterways or other safe disposals. As with tied ridging, if there is going to be surface run-off it must be along the terrace, not over the edge of the terrace and down the slope with consequent risk of erosion. For CBTs a common method is to make the level of the outlet at the end of the terrace one half of the height of the bund on the edge of the terrace, ensuring a freeboard of half the bund height. · This is a high-cost system which has to be paid for by high yields and so a high level of inputs is required, particularly seed, fertilizer, and crop management. Adequate levels of fertilization are required to avoid this being the constraint after the moisture limitation has been removed. · The main design factors are the width of the levelled terrace and the ratio of the area of the terrace to the catchment area. The width of terrace is governed mainly by the machinery to be used. As the width of planters and drills continues to increase, so does the need for wider terraces, but this is restricted by the slope and the depth of soil. Typical widths are from 10 metres on land of 5 - 6 percent, to 30 metres at 2 percent, and 50 metres or more at one percent. 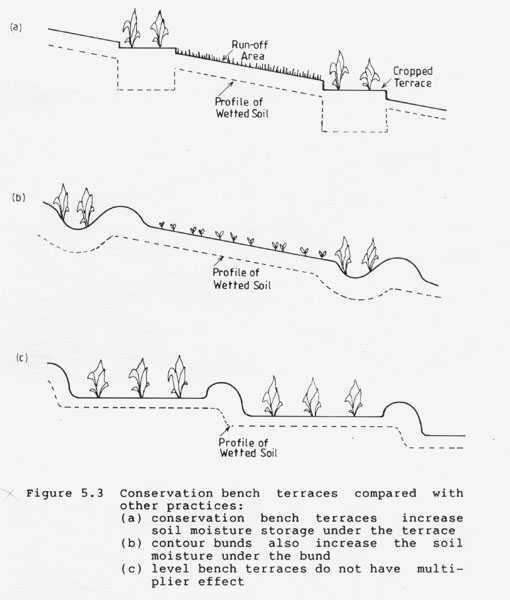 Jones (1981) reports mini-terraces 9 m wide with a 1:1 ratio and different rotations on the catchment and the terrace. Total yield was doubled on the terraces. · The most usual practice is for the bench terrace to be level along its length, but there have been a few trials with the terraces on a gentle gradient of 1:400 to encourage safe disposal of excessive run-off. · The ratio of catchment to terrace may be from 0:1 (in which case the whole land surface is converted to level bench terraces) but typical values are 1:1 or 2:1. In general, the lower the mean annual rainfall the larger will be the required catchment area to provide sufficient moisture for the crop. Another consideration will be the type of rainfall since run-off will only be produced from storms where the intensity exceeds the infiltration on thecatchment area. The treatment of the catchment area will also effect the amount of run-off. In very dry areas the catchment may be left uncultivated to promote run-off, while in the south western USA the usual practice is to have continuous cropping on the bench terrace with a rotation on the catchment area. A common rotation on the catchment is wheat/sorghum/fallow, giving two crops in three years. Table 5.1 gives examples of the rainfall multiplier effect. Results of the American experience show that the method is suitable and economic for the high-input large-scale mechanized farming of the region. The costs of land preparation can be expected to be recovered in about 10 years. Complete bench terracing of the whole land surface some- times gives the greatest cash return since the whole of the land is cropped, but the cost of terracing is much higher. With a ratio of 1 terrace:2 catchment the terracing costs are only one third, and in several studies this was the most economic system (Jones and Shipley 1975). * The actual amount will depend on the water use efficiency, i.e. allowing for losses from seepage and evaporation. The calculated bench was 2.4 m wide, and the catchment 16.3 m (data from Flug 1981). These calculations assume 100% efficiency, compared with Finkel's method. Because of the high cost of installation of CBTs, it is not appro-priate at very low rainfalls. The main application of the system is to increase the yield and reliability of yield where rainfall is nearly sufficient for crop production, in the range 300-600 mm. Improving the probability of getting a reasonable crop may be more important than numerical increase of yield. For methods more suitable in lower rainfalls see Section 5.2.4 for simple methods, and Section 5.3 for methods which use water spreading. On heavier soils, contour bunds may be less effective because of the lower infiltration. Studies on vertisols in India showed that yields were lower near the bunds, both upslope and down, as a result of waterlogging (ICRISAT 1976). 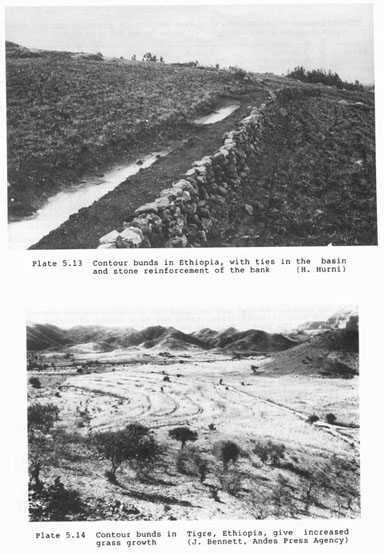 Contour bunds are also used in Ethiopia (Plate 5.13) for a combina- tion of soil conservation and water conservation. The bunds are built on level grade with ties in the basin. 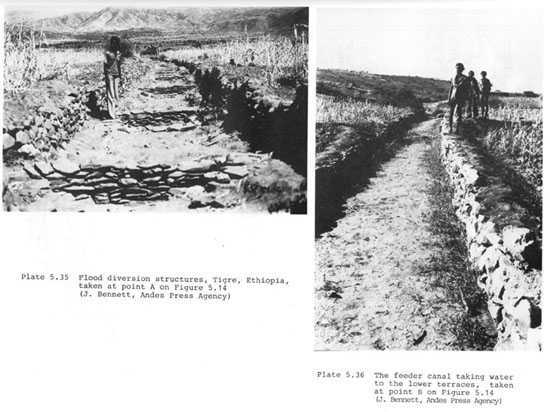 A stone wall is built on the lower side of the earth bund in an attempt to reduce damage if the basin is over- topped, but this has not been very successful, and it would be better to put the bunds on grade if it is likely that they will not be able to hold all the run-off (Hurni 1984). Contour bunds are also discussed in Section 4.3. Another successful example, from Ethiopia, is shown in Plate 5.14. If the contour furrows are not laid out precisely on the contour, or are built with some irregularities, there may be a danger of uneven depths of ponding behind the bank. This can be reduced by smaller bunds at right angles, but as with tied ridging, these bunds should be lower in height than the main ridges so that if there should be any overtopping it will be laterally along the contour and not over the bund and down the slope. Sometimes the emphasis is on the excavated furrow which collects water, so that in exceptional storms the run-off can overflow without damage. A disadvantage of contour bunds at intervals down the slope is that the crop tends to be uneven, reflecting the soil moisture profile in Figure 5.4, and only a small part of the field is cropped. But the point is that it enables some crop to be grown where otherwise the rainfall would be inadequate for any cropping. The energy input for building the ridges is still considerable but several ox-drawn ridgers are available, and more expensive but more efficient tool bars, as discussed in Section 5.2.1. Even if the whole operation has to be done by hand labour this may be acceptable if it is replacing a traditional system which also has a high labour requirement. 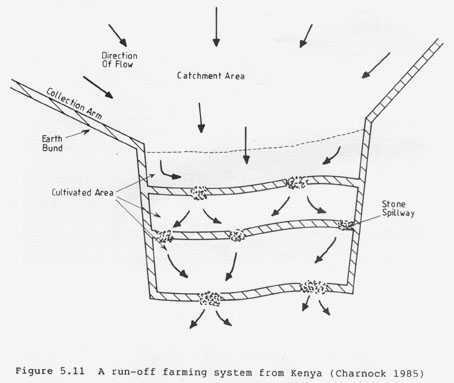 This was the situation in the Kenya example reported by Smith and Critchley, where the traditional method consisted of deep digging by hand to increase the infiltration and moisture storage. Another approach to localized surface storage on part of the land is the use of small semi-circular catchments or larger rectangular or trape- zoidal structures (see Figure 5.5). The large number of separate semi- circular or trapezoidal bunds spreads the risk of damage from overflow in exceptionally heavy rain, or if one bund fails. The semi-circles are usually constructed by hand, and are larger versions of range pitting which is used to promote vegetation on grazing land (see Section 7.1 and Plates 7.5 and 7.6). In several semi-arid climates in Africa the farmers have shown more interest in using these techniques for crops than for range improvement (Smith and Critchley, 1983, describing the work in Baringo, Kenya, and Wright, 1984, working in Burkina Faso). The trapezoidal bunds were developed by Finkel (1985)in Turkana, Kenya, and can be built by hand or machinery. Semi-circular hoops built of stones for tree planting are discussed in Section 7.2.2 and illustrated in Plate 7.21. The trapezoidal bunds can be from 0.25-2 hectares, and so are more suitable for cultivation. They can be levelled within the bund to ensure more uniform spreading of the retained water, but this may not be a good idea if there is a concentration of fertility in the topsoil. One tip of the bund may be slightly lower to serve as an overflow spillway, which can be protected with simple stone paving if there is any danger of erosion. Both semi-circular and trapezoidal bunds can be staggered on alternate rows, so that the overflow from one row will run into the next downslope, and ensure that all are filled before there is any run-off from the field. Both types are best on gentle slopes, especially trapezoidal bunds which are best limited to slopes of less than 2 percent, because at steeper slopes the bunds have to be built up higher and so need a high labour input. Small basins are used to catch and store water in many countries, sometimes called pitting, rather like the tied ridges discussed in Section 5.2.2. 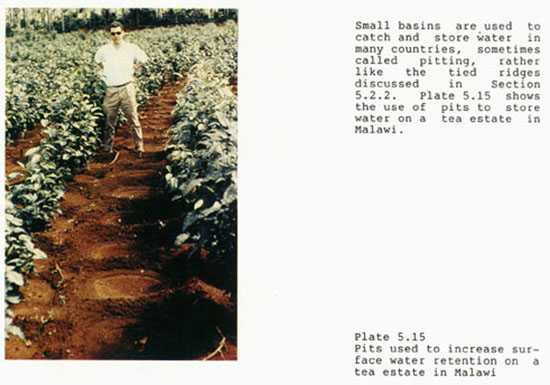 Plate 5.15 shows the use of pits to store water on a tea estate in Malawi. Where the whole of the soil surface is shaped, the ratio of run-off area to run-on area is governed by the configuration as shown in Figure 5.6 and Plates 5.16 and 5.17. The land may be shaped by ploughing, as in Plate 5.17, or by ridgers used with oxen, as in Plate 5.18, or tractors as in Plate 5.19. An important advantage of small run-off producing areas compared to larger ones is that they will yield run-off from smaller rain storms. This was discussed in Section 5.1.3. At the Central Arid Zone Research Institute in India, using narrow strips with a ratio of run-off to run-on of 0.75 (catchment) to 1.0 (cropped), threshold values of rainfall for inducing run-off were between 3 and 15 mm for moist surfaces and 7 to 9 mm for dry surfaces. The possibility of increasing run-off through surface applications of bentonite or sediment from tanks was possible but unlikely to be economic. Another possibility which could have practical significance is changing the configuration to increase the slope of the run-off area (Jain 1980). 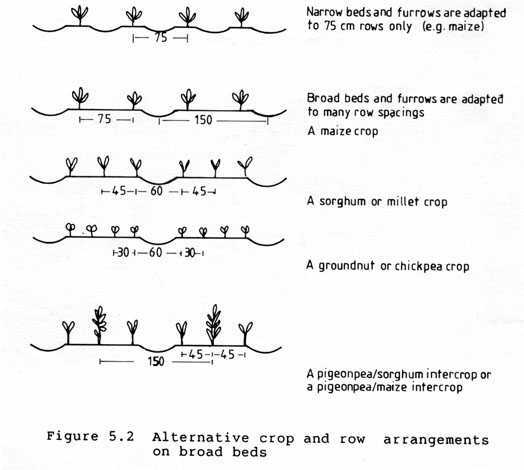 A system of creating furrows on sloping land using asymmetric ridgers was shown to be successful for maize production on an experimental basis in Mexico (Garduno 1981), see Figure 5.7. A configuration suitable for flat or very gently sloping land, is shown in Plate 5.20 and comes from studies in Mexico. A similar cross- section but on a small scale was shown to be successful in Colorado by Fairbourn (1975). Low cross-ties can be used to help obtain a better distribution of water since they reduce accidental run-off if some of the lines have a fall. 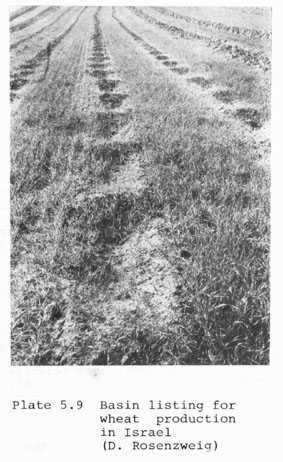 Fairbourn also showed that infiltration could be increased by burying crop residues in a narrow trench in the cultivated area; he called this vertical mulching but the extra complication of trenching and filling make this practice unlikely to be adopted on a wide scale (Figure 5.8). It bears some relation to a simpler variation in which crop residues are thrown into the bottom of furrows and the ridges are split onto the furrows to form a new ridge for cropping the following year. Subsoiling or deep ripping in the furrow may also be used to increase infiltration, particularly when there is a clay pan or a laterite layer. Treatment of the run-off area with additives, as in Plate 5.20, is unlikely to be economic, but it may be possible to take advantage of naturally occurring soil properties to increase the run-off. A case in point is Botswana where the sandy soils known as the 'hardveld' become hard and crusted after heavy rain. 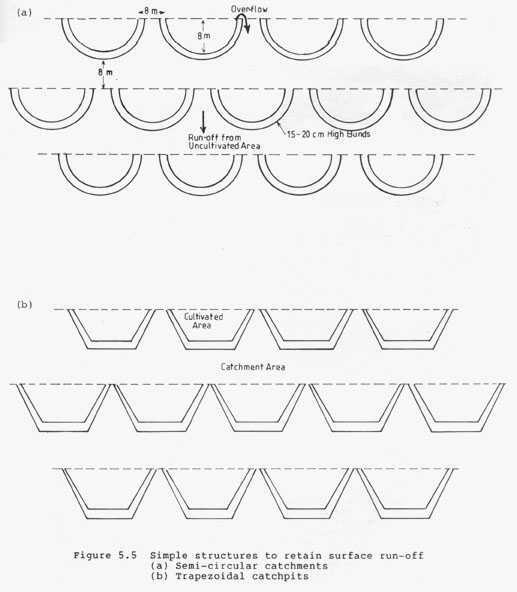 A method proposed there by Nilsson consists of forming permanent low ridges about a metre wide which are left to develop this hard crust, while ploughing, cultivating, and planting are restricted to narrow strips of 30 cm (Figure 5.9). This system has the advantage that after it has been established, no further maintenance is required. The concept of strip tillage on the contour with ripping to encourage infiltration was tested in Tanzania by Macartney et al. 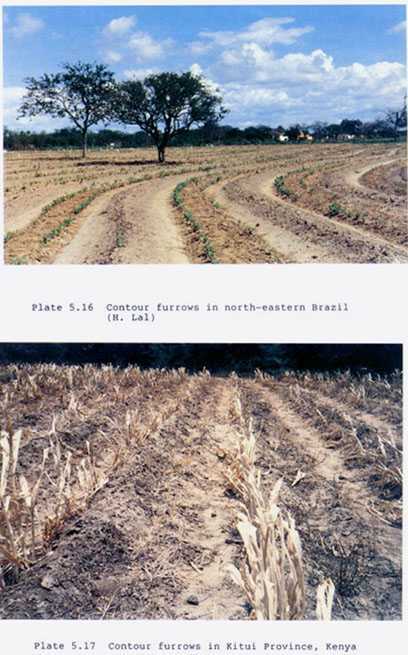 (1971), and in Botswana, Willcocks (1981) showed that precision strip tillage was more effective than other cultivation methods, particularly if the strips could be consistently aligned along the previous crop rows. The practice of cultivating to leave ridges and furrows on the contour without any additional land shaping was discussed in Section 4.2. It appears to be more common for maize and sorghum to be planted on the ridges, and small grains in the furrows. The practice of drilling wheat, barley, and rye into small furrows is reported from Poland by Wollen (1974) and is common in the wheat growing areas of Kazakhstan, USSR. In low rainfall areas a large ratio of catchment to cropped area is required, but it is not easy to design a system which will give the best result for all variations of annual rainfall. In some experiments in North America the ratio of 33:1 was tried, and with 190 mm of rain gave 530 mm of run-on to the farmed area, which was more than required and more than could be absorbed. The next year the ratio was reduced to 15:1, but the rain was greater at 246 mm and with a higher run-off coefficient gave 390 mm of run-on, about the right amount. Retaining the ratio of 15:1, the next year had 140 mm rain, giving 220 mm run-on which was not sufficient. The authors (Morin and Matlock 1975) suggest that mathematical modelling is an appropriate tool to design the optimum ratio for varying conditions of soil and climate, but as we have discussed previously, any system is going to have widely varying degrees of success or failure from year to year. 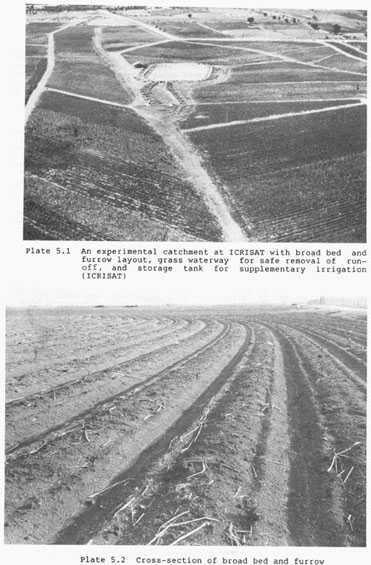 In a region of low winter rainfall, using saw-tooth ridges shaped by motor grader, Shanan and Tadmor (1979) found that the best ratio of catchment to planted strip could vary from 4-20. The very wide range suggests that trial and error may be as effective as mathematical modelling. Here again we have a wide variety of methods for different conditions. The soil type influences the method in several ways. Clay soils have low infiltration rates and high moisture storage capacity, so they are suitable for deep flooding with subsequent cropping, e.g. the tanks in India described in Section 5.3.3. Sandy soils have quicker infiltration and lower storage which tends to go with the diversion schemes of Section 5.3.2. A deep soil can absorb larger amounts of water, while a shallow soil may need the provision of overflow outlets to avoid drowning the crop. The climate too; affects the method. Mediterranean climates have winter rainfall and low evaporation which may make possible run-off farming with mean annual rainfall (MAR) down to 100 mm as in the Negev desert in Israel (Evanari et al. 1982) and in Tunisia (Damagnez 1979). But with tropical summer rainfall and high evaporation, water harvesting is most likely to be useful in areas with more than 250 mm. The probability of high-intensity rain influences the method. In the Negev most rain falls in light showers so the objective is to maximize the run-off (discussed in Section 6.2). In tropical Africa the problem is to handle the sudden floods from violent summer thunderstorms. If the rain and the growing period do not coincide, the object will be to store water for later use. If the rainfall and growing period are the same, the desired result will be several applications of water during the period of crop growth. There are many examples of traditional use of naturally occurring run-off to augment rainfall in areas where the rain alone is not sufficient for growing crops. Some authors have described this as "exploiting micro-niches in the environment". In North America the culture of many Indian tribes has depended for centuries on simple methods of floodwater farming. For example, the Navajo in Arizona use run-off from sandstone outcrops to water alluvial soil at the base of the hills (Billy 1981). Good crops of maize, squash, and melons are produced where the annual rainfall is only 300-400 mm (Figure 5.l0a). This type of scheme usually does not use a large investment of labour to manage the water, but advantage may be taken of any favourable feature, such as a road which can act as a collector drain (Figure 5.lOb), and to some extent the run-off may be managed by leaving the upper part of the field unplanted (Figure 5.10c), or increasing the storage by a simple impounding dam (Figure 5.10d). Several other tribes use floodwater farming extensively in the south-west of North America, for example it is the practice of the Hopi tribe on three quarters of their cultivated land, although the area so used today is only one third of what it was in former times (UNEP 1983). · where run-off collects in naturally occurring depressions, as the 'cuvettes' in West Africa. In Africa these conditions are all exploited, for example a case in Turkana, Kenya, reported by Morgan (1974) and Hillman (1980). In a mainly pastoral community with annual rainfall of less than 200 mm, small patches of sorghum are grown in all the first three situations. 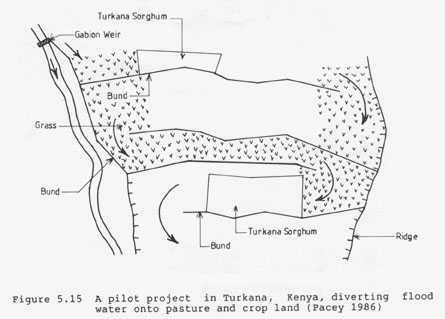 Local traditional practice and familiarity with local conditions may be useful when consider- ing possible sites for the development of more ambitious run-off farming schemes, and this was the case in the Turkana example (Cullis 1985). Where the rainfall is sufficient for general cropping (and this usually means more than about 500 mm), it may still be possible to make use of run-on areas by increasing the cropping intensity. In the use of con- servation bench terraces (Section 5.2.3), separate rotations are used for the run-off area and the run-on terrace. The same principle is applied to natural run-off in Morocco (Kutsch 1982 reported in Pacey 1986). When growing wheat or barley, a plant density of 70-90 plants/m2 is used on land receiving rain only, but the plant density is increased to 90-120 plants/m2 in depressions which collect run-on. This does entail an element of chance, described by Pacey as "the deliberate reduction of plant density results in some sacrifice of yield in seasons of ample rainfall, but it makes for greater certainty that there will be useful grain production in a drought year." 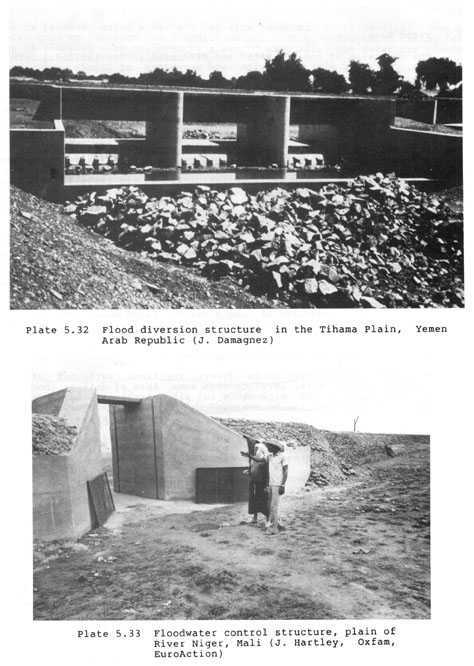 Two examples are reported by Kovda (1961) of the use of naturally occurring run-off in arid areas of the USSR. 'Kair' farming is the name given to cropping on flood terraces of the large rivers of central Asia where the soil moisture is partly the result of surface flooding, but also by lateral seepage from the river. Another example is 'khaki' farming in Turkmenistan where run-off from rain on higher mountain slopes inundates gentle slopes in the plains. The flooded fields are left to dry out and then cultivated and planted as soon as is practicable. A similar practice is reported from Ethiopia by Carr (1979). In the Woito and lower Omo valleys, as soon as the annual flood recedes, the flood plains are cleared and planted to maize and sorghum, using heavy seeding rates which are thinned later. The previous Section describes some uses of natural or unimproved run-off, while this Section is about schemes where there is some element of manipulation or management of the land or the run-off. The difference is not important, because some systems use only very simple works. 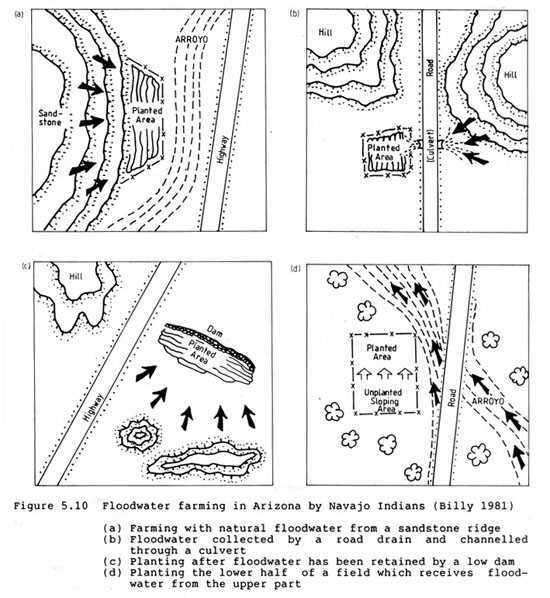 For example, the floodwater farming of the Hopi and Navajo Indians of northern Arizona, described in Section 5.3.1, is very similar to that of the Papago Indians of southern Arizona who make simple barriers of wooden posts and woven brush to spread natural floodwaters more evenly (Nabhan 1979). It is not important whether we consider run-off farming as a type of irrigation. In the case of terraced wadis and other water management schemes in valley bottoms, man sets out to manage both the land and the water. Farming valley bottoms is a very ancient practice and has been well documented in Tunisia and in the Negev desert in Israel. In the Matmatas of Southern Tunisia the system is called 'Gessours'. In an area with only 100-150 mm of rain, rows of olive trees are planted across the width of the valley bottom near a minor barrage, which slows down the floods, and result in deposition of silt with a terracing effect (Plate 5.21). Cereal crops are grown on each terrace upstream of the olive trees. This is similar to the terraced wadis in the southern Negev in Israel (see Plate 5.22). In some cases these ancient schemes are partly cultivated today by the mainly pastoral Bedouin inhabitants (Plate 5.23). Another example of carefully controlled water use in valley bottoms comes from Colorado (Mickelson et al. 1965). Level pans of one to three hectares are formed in broad valleys where slopes are less than 3 percent. The rainfall is 400 mm, sufficient for some rather unreliable cropping of grain or forage sorghum. The cropped land yields 5 to l0 percent of the rainfall as run-off from the heavy summer storms. The run-off from 150 ha of cropland is spread onto the first level pan, and when the depth reaches more than 100 mm the surplus spills over to the second pan and so on. During the season an additional 200 mm of water results in good crops on the pans, so that the installation costs can be repaid in three to five years. In most schemes involving flooding of crops, it is usual to provide outlets for emergency overflow, and possibly for draining as well, because growing crops appear to be less affected when there is a slow continuous passage of water than if the water is stationary. Also most crops only tolerate complete saturation for a short time. Some of the ancient Negev valley floor cultivation systems used only spate run-off down the valley, but most of them depended also on the collection of run-off from the surrounding hills. Some examples are shown in Plates 5.24a to d. Some had sophisticated methods for inducing run-off, collecting it in channels and distributing it to the various terraced fields. A fascinating programme of research has been conducted for twenty years by the universities and research institutes of Israel and has been splendidly recorded (Evenari et al. 1982). The surface management to induce run-off included collecting and piling all the loose surface stones into mounds, and shaping the surface into ridges which are very similar to the roaded catchments used nowadays in Australia (see Plate 5.25). The hydrological effects of removing the stones are explained in Section 6.2.1. and the effect of building ridges in Section 6.2.2. The collection systems in the Negev show that the hydrologic principles were fully understood. Stone-lined conduits were used to take the water quickly down to the farms with minimum loss by infiltration and evaporation, and the catchments for these drains were long and thin so that rain was collected even from the low intensity winter rainfall common in this area. The distribution systems were also simple in construction but sophisticated in concept, and allowed the water to be transferred and diverted around the farm quickly and efficiently with minimum labour requirements. 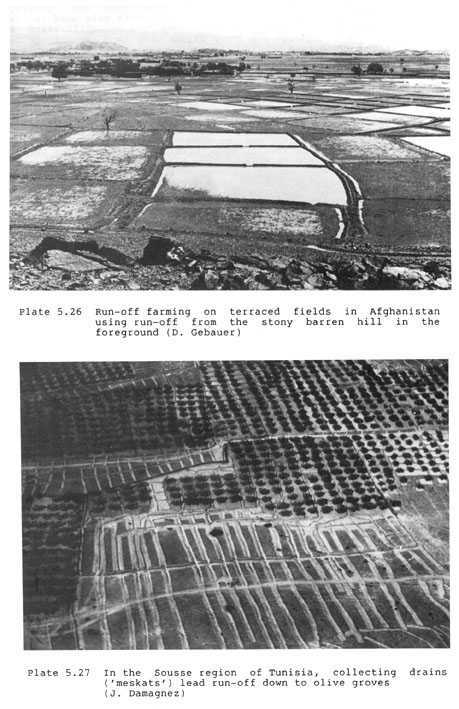 As a result of the successful studies in the Negev desert, trials of run-off farming were carried out in the Khost plain, in Paktia province of Afghanistan. The terrain is similar to the Negev; stony barren hills where run-off is collected in channels and led down to the plain. Level fields, surrounded by an earth bank, are laid out in shallow steps so the water is passed down-slope from field to field (Plate 5.26). After the soil profile has been saturated a cereal crop is grown on a combination of subsequent irrigations if there is rain, and the stored moisture in dry periods. Another ancient collecting system called 'meskats' comes from the Sousse region of Tunisia with a rainfall of about 300 mm. Olives are grown on the better soils at the bottom of slopes. On the upper slopes, the soils have a tendancy to surface crusting and yield run-off into long thin catch- ment areas feeding the water down in channels to the olive groves (Plate 5.27). These methods, developed for regions with winter rainfall, may not be suitable for the semi-arid tropics. Summer rainfall is more intense, so in general the catchment area required will be smaller, and provision for the safe passage of exceptionally high rates of run-off must be included. Figure 5.11 shows a system which has been tried on a small scale in two areas in Kenya, in Baringo by the Baringo Pilot Semi-Arid Area Project (BPSAAP) and in Katui by the Arid and Semi-Arid Lands Project (ASAL). Although not yet adopted to any great extent by the local farmers, the national policy of land allocation to what has traditionally been a mobile pastoral community, will probably lead to a stronger motivation for regular cultivation on permanent plots, which will not be possible without some form of water harvesting. Ratios of catchment area to cultivated land of up to 5:1 are expected to be suitable. For the system to work well, the cultivated area should be levelled so that there is little or no lateral slope along each terrace, and only a gentle slope across the terrace to avoid erosive flows. Stone-packed spillways built into the earth bund allow surplus water to pass progressively downslope to lower terraces. The danger of damage from excessive floods should be avoided, not by trying to control the water once it has reached the cultivated area, but through the provision of overflow by-passes set into the bank of the collection drain. There is no doubt that such a system can be made to work on an experimental or demonstration basis, and the question is whether the pressures of social change will make it sufficiently attractive to people unaccustomed to a cropping system which requires this degree of precision and maintenance. Another form of water spreading in USSR known as 'liman' irrigation is described by Kovda (1961). This consists of what are described as contour ramparts across the slope, perhaps an apt description since they are large structures up to two metres high and four or five metres wide (similar to the 'murundum' water conservation structures used in Parana State in Brazil). Sometimes drain holes are used to pass the water through to lower levels, although an open spillway would appear to offer a simpler and more effective way of controlling the water movement. The diversion of run-off water onto prepared level terraces is another ancient and widely used method. This is the basis of growing irrigated paddy in humid areas where water supplies are assured, and the same principles may be used to obtain benefit from intermittent water supplies in semi-arid regions. 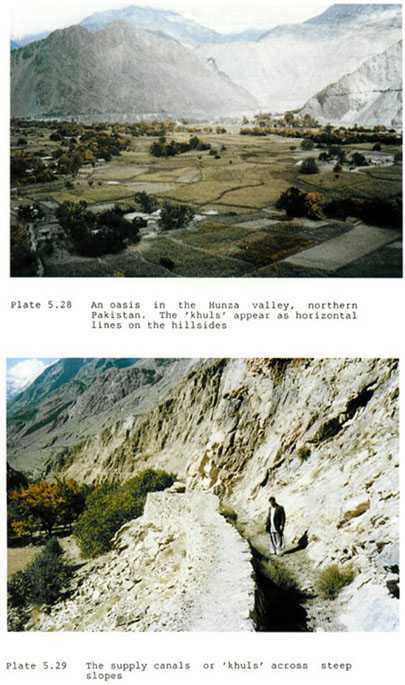 For example, in the mountainous dry areas of northern Pakistan, in the district of Gilgit and the Hunza valley, agriculture is entirely dependent upon the diversion of springs, streams, and melt waters from snow and glaciers, onto terraced alluvial outwash fans which are accurately called oases, Plate 5.28. Some amazing construction feats have been used to carry the 'khuls' across unstable scree slopes, and laboriously cut by hand out of rock faces, Plate 5.29. 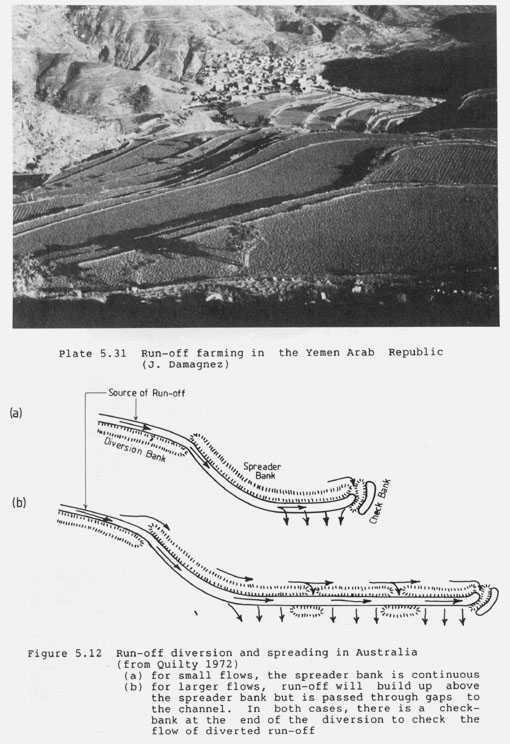 Another interesting example of diversion onto terraces comes from the Manakhah region of the Yemen Arab Republic (Damagnez 1979, Vogel 1985). In an area of annual rainfall of 400-600 mm, level bench terraces are constructed on steep slopes up the hillsides, with rock risers 2-3 m high and the terraced fields 2-l0 m wide (Plates 5.30 and 31). Run-off from the uncultivated and unterraced upland is carried to the terraces in diagonal ditches reminiscent of those in the Negev. Stone-lined canals carry the water progressively down through the terrace system, sometimes with the canals running underneath the terraces. This sophisticated and efficient system is presently falling into decay (see Plate 4.18) because of labour migration to the oil producing countries of the Middle East. A similar system in the Yemen Arab Republic, called 'sayl' irrigation, is the diversion of flood water out of wadis onto levelled terraces. The management of grazing land is discussed in Chapter 7, but a water spreading system from Australia is worth mentioning. In New South Wales, Australia, run-off occurs from eroded and degraded ridges and is absorbed on the flat land below the ridge, but produces only inedible scrub vegetation, sometimes called 'mulga' after the dominant shrub, Acacia aneura. Two approaches are used to make more efficient use of the rain- fall. 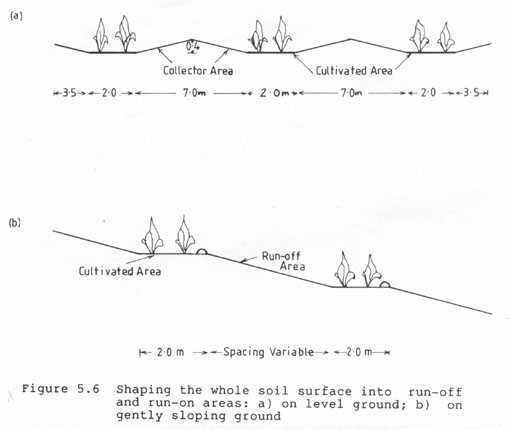 One is to encourage useful grass growth by retaining it on the ridges using short contour furrows as described in Section 7, (Cunningham 1967 and 1975). The other approach is to catch the run-off in drains and lead it to where it can be spread on land for fodder crops and pastures. The collector drain has the bank on the lower side; the spreader drain has the spoil bank on the upper side so that the water spills evenly over the downhill edge of the channel (Figure 5.12). During large run-off flows, water also collects on the upstream side of the spreader channel, so gaps are provided to allow this water to pass through into the spreader channel (Quilty 1972). Some examples of naturally occurring short-term flooding were described in Section 5.3.1, mainly on flood plains and in valley bottoms. This Section describes systems where flood waters are impounded and retained long enough to saturate the soil so that a crop can be grown on moisture stored in the soil. Simple systems on a small scale are used in the Sudan. On gently sloping land embankments known as 'teras' collect and hold surface run-off, and after the water has soaked into the soil a short duration millet is planted and matures in eighty days (Pacey 1986 p 131). In the semi-arid north-east of Brazil, the government research organization CPATSA in Petrolina has studied a similar method, and produced designs for the optimum shape and size of the bunds. There are also recommended cropping methods to make maximum use of the stored moisture, with variations in the cropping pattern depending upon the amount of rainfall and the amount of run-off stored (EMBRAPA 1981). The inundated areas are known as 'vazantes'. In India the use of contour bunds to retain run-off has a mixed story of success and failure. When used mainly as a soil and water conservation measure in areas of reasonable rainfall (750 mm - 1250 mm) on medium-deep vertisols, it was found that the disadvantage of waterlogging in the vicinity of the bund both uphill and downhill exceeded the advantage of increased cropping from the stored moisture in a dry season (ICRISAT 1975). But in areas of lower rainfall the method has been more successful, for example in the Siwana district of western Rajasthan. With a rainfall of 250 mm or more, low contour bunds only 0.3 m high divide the land into strips which are progressively inundated down the slope with flooding to a depth of 0.2 m during the monsoon. When the rain ceases, the stored water infiltrates and a winter crop is sown. In semi-arid areas of India, large-scale inundation schemes have been used for hundred of years, some with sophisticated forms of water control and land management. In Bihar and Uttar Pradesh there are thousands of 'ahars' covering a total of more than 800 000 ha. Low earth bunds are built to retain run-off during the monsoon and when used on very gentle slopes, sometimes as low as 0.01 percent, water stored to a depth of one metre will throw back several kilometres, so large areas of land are covered. Most ahars flood less than 500 ha but others are as much as 4000 ha (Kolarkar et al. 1980 and 1983). The volume of water stored is less important than the area of land which is submerged. The soil must have sufficient depth and moisture-holding capacity to store enough moisture to carry a five month crop which is grown in 'rabi', the dry winter season, after the end of the summer monsoon season, 'kharif'. The retaining bank is usually not more than 3 m high and may extend several kilometres on the contour, with some examples up to 10 km. There is usually a wide waste-weir to serve as emergency spillway, usually stone pitched with a crest level one metre below the top of the bund to give one metre freeboard for wave action. The emergency spillway is required partly because of the danger of a heavy storm occurring when the tank is nearly full, and also because the ahars are usually built in a series down the slope and the failure of any one would imperil those lower down the slope. It is also usual to provide metal sluice-gates set in concrete structures to allow for quick emptying when necessary at the end of the rains. The water released may be collected in the next ahar down the slope. Sometimes pipes are laid through the bund if some of the discharged water is to be used for irrigation. The main crop is winter wheat planted as soon as the flooded land has dried out sufficiently, and then grown out on the stored moisture. Sometimes a subsidiary crop is taken during the summer monsoon while the land is flooded, using a variety of rice known as 'floating rice' because it can grow up through the standing water. This technique of taking one crop of floating rice followed by a second crop after the water has receded is also practised in Thailand. A secondary advantage of this system is that the soils in these semi-arid areas often have a tendency to salinity, and this is controlled by the regular leaching by the inundation water. The infiltration of considerable amounts of water may also have the effect of raising the general level of the water table near to the ahars, with improvement of the supply in shallow wells. Another form of inunadation farming is used in the Jaisalmer district of Rajasthan (Kolarkar et al. 1983). Here the topography is more broken, and the method is to build an earth bund across the valley plain to catch and store run-off and silt from the surrounding barren hills. 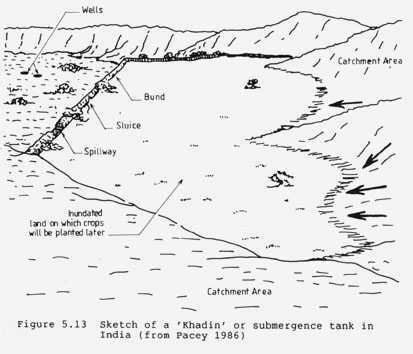 These are called submergence tanks or 'khadins' (Figure 5.13). In the district of Jaisalmer there are more than 500 such tanks with an inundated area of more than 12 000 ha. A catchment ratio of at least 15:1 is usual and the tanks are designed to fill from rainfall of 75-100 mm, in an area where the annual rainfall is 165 mm with great variability. The main construction features are the same as the ahars, that is a wide emergency spillway and sluices to release the water. The depth of water stored varies from 0.5 to 1.25 m and it usually disappears from seepage and evaporation by early November, when the winter crop is sown, either winter wheat or the grain legume Cicer arietinum, (Bengal gram or chickpea). Similar systems of inundatiion farming Pakistan are known as 'sailabas' and 'kuskabas'. Secondary benefits of most inundation systems are the leaching of salinity by the stored water and the improvement to the yield of wells downstream. The diversion of run-off water was discussed in Section 5.3.2. This Section is concerned with diversion and spreading of floods and spate flows. Diversion of flood water from its channel usually involves some form of structure, a barrage or weir to divert the water. For small schemes, simple diversions may be constructed each year using stones and boulders, perhaps in wire netting, or poles and brushwood where these are available. It may be sensible to expend only limited effort on building such struc- tures where it is probable that they will be periodically destroyed by flash floods, and an example from Yemen was quoted in Section 4.1.4. The floods are also likely to damage the conveyance channel unless it is pro- vided with safety devices to spill water picked up in large floods. To avoid these problems a method has been widely used in India for centuries, the inundation canals, or 'pynes'. A canal is excavated in the river bank so that the level of the canal bed is considerably higher than the bed level of the river. During low flows the canal is dry, but when the flood level rises to that of the diversion canal it starts to flow. There is no need for any structure in the stream or river channel. This system is widely used in the Sind province of Pakistan to collect water from the Indus river and its tributaries during the flood period from April or May to September. The grade of the distribution canals is slightly flatter than that of the river bed to increase the command of the diverted flood water. This also means that there is heavy deposition of sediment parti- cularly at the beginning of the canal, and regular clearing is essential. Some control is also required of the diverted flood water and this is usually done by a regulator several kilometres from the river. Subsequent control and distribution of the water is the same as for any surface irrigation scheme, except that the flow is ephemeral and used for heavy inundation so less precise control is required. · deposition of sediment carried within the flood water. In some cases the last one may be considered beneficial, as in the flood irrigation in the valley of the Nile, and flood irrigation in China from silt-laden rivers, where this is known as 'warping' and considered to be part of the process of maintaining fertility. The mica-laden melt waters from the glaciers of the Himalaya are used to build up the physical volume of soil by spreading the water onto gravel beds. On the other hand, too much deposition of sediment can lead to undesirable change of soil texture, or to reduced yield of grassland. 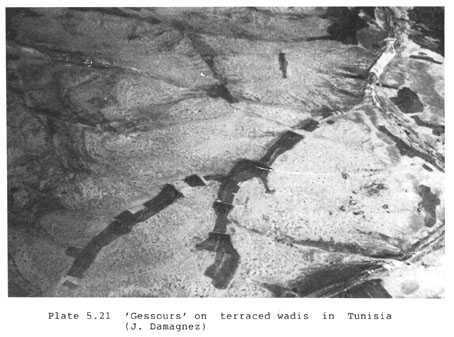 Another example of large-scale diversion of flood waters comes from the Yemen Arab Republic where the valleys discharge into the Tihama desert which bounds the Red Sea, using elaborate diversion structures as shown in Plate 5.32 (Damagnez 1979). 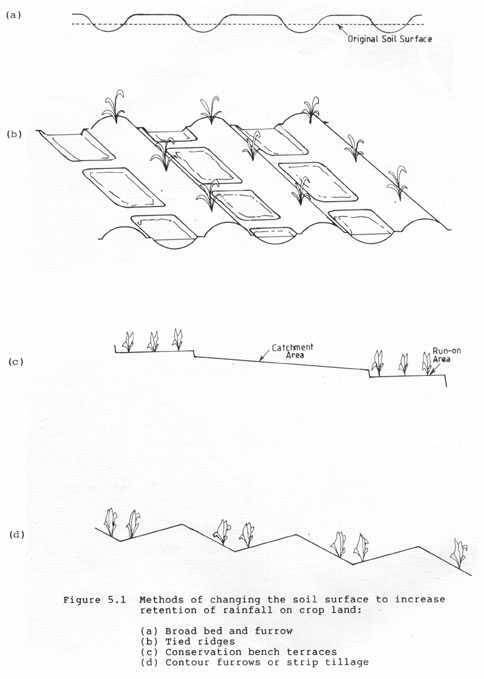 Another variation of large-scale use of flood water is illustrated in Plate 5.33, where structures are used to control the flood water after it has spilt naturally from the River Niger. 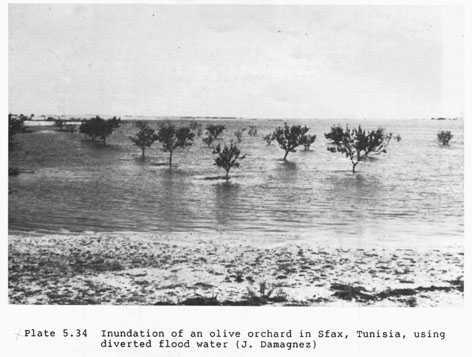 Plate 5.34 shows an example of using spate flood water to inundate an olive orchard in Sfax, Tunisia, in an area with an annual rainfall of 150 mm. 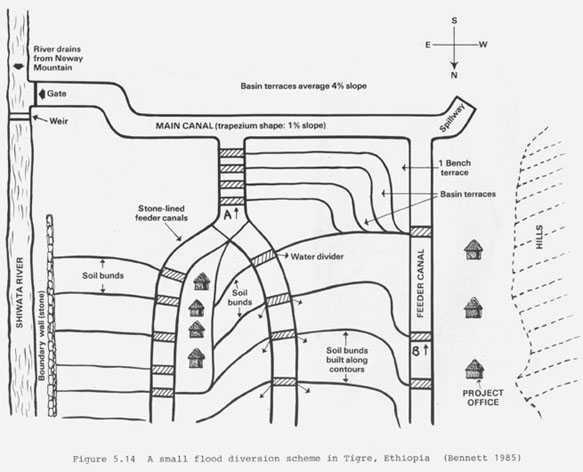 The diversion of flood water can also be practised on a smaller scale as illustrated in Figure 5.14 showing an interesting project in Tigre, Ethiopia. Water is first diverted from the river and then distributed using a simple system of structures constructed from local stone, shown in Plates 5.35 and 5.36. This is a development project sponsored by the UK charity War on Want, and is continuing. A similar scheme on a pilot project in Turkana, Kenya, is shown in Figure 5.15. This pilot project was successful for a short time but was soon abandoned, first because of siltation at the diversion weir and later because the river changed its course. A basic problem with the introduction of schemes like this is that permanent cultivation on settled sites is not part of the traditional farming system, so there is little interest, and little motivation for the regular maintenance which is required. However there are some indigenous water spreading schemes, and examples from the Sahelian belt are reported by Pacey (1986), stretching from Southern Mauritania and Niger to Sudan and Somalia. 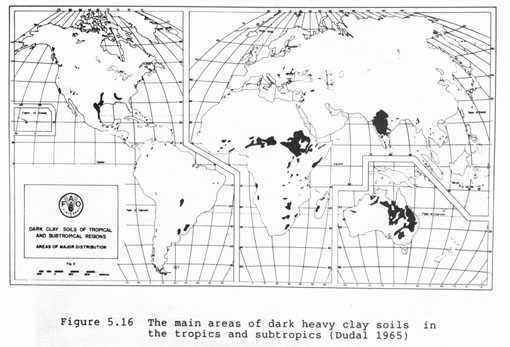 Other examples of indigenous soil and water conservation methods in Africa south of the Sahara are given in a study commissioned by IFAD (1986). Examples of the diversion of flood water to improve grazing are discussed in Chapter 7. The main problem in semi-arid climates is shortage of water, but there are still occasions when at particular times or on special soil conditions the problem is too much water, and some form of drainage is required. A soil where some form of water control can be important is the vertisols, heavy clay soils, usually dark, also called cracking black clay soils, cotton soils, and self-mulching clays. They are also known collo- quially as 'one-day soils' because they are difficult to cultivate when dry and hard, and also unworkable when saturated and sticky, but they do have a short window while drying out when the moisture is just right for cultiva- tion. The physical properties causing this are a high clay content, with the clay mineral being montmorillonite or illite, which, because of their 2:1 lattice structure, expand when wet, and shrink and crack when dry. A characteristic surface feature is the development of an uneven surface with raised mounds and shallow depressions caused by repeated cycles of wetting and drying and known in Australia as 'gilgai'. The occurrence of vertisols is mapped in Figure 5.16 from Dudal (1965). The two main kinds of formation are the large uniform areas derived in situ from extensive volcanic flows of basalt, or smaller local- ized alluvial deposits in valley bottoms as in Ethiopia, Zimbabwe, and Zambia. In both situations, vertisols have considerable economic signifi- cance because they are a land resource with under-utilized potential owing to the difficulty of handling them. One technical solution is the installation of subsurface drainage, and this was shown to be effective more than twenty years ago in Zimbabwe (Robertson 1964). Pipes of concrete, fired clay, and bamboo were all effective but uneconomic because of the cost of materials and transport. Today, the most appropriate method would be the installation of plastic tube drains by the trenchless method. The techology is available, but a high return would be required to justify the installation costs. Mole drains would be cheaper but the extremes of wet and dry conditions would lead to a short life. Surface drainage is the more practical alternative and has been thoroughly developed and tested at ICRISAT in India, using the broad bed and furrow method described in Section 5.2.1 (Krantz et al. 1978, 1981, and Swindale and Miranda 1984). In India, surface drainage can lead to the opportunity for early dry-sowing just before the start of the monsoon where the onset is fairly predictable (Krantz 1981). This a1lows double cropping instead of the traditional practice of the vertisols lying fallow during the monsoon, and only being cropped in winter on the stored moisture. 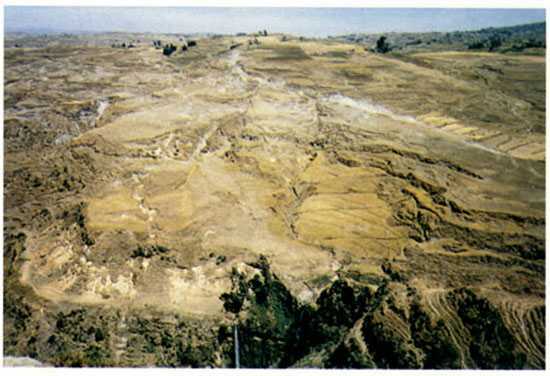 In Ethiopia the occurrence of vertisols is in smaller areas in valley bottoms, which remain either uncropped altogether or only cropped towards the end of the rainy season. Improved ease of cultivation, through surface drainage by raised bed and furrow or by shallow open drains, could lead both to improved production from the areas now cultivated, and also to a large increase in the area used for crop production. The seeds are minute and broadcast onto a very fine tilth, and can easily be washed away by any surface run-off. The traditional solution is small open drains on a very steep gradient to intercept any surface flow. 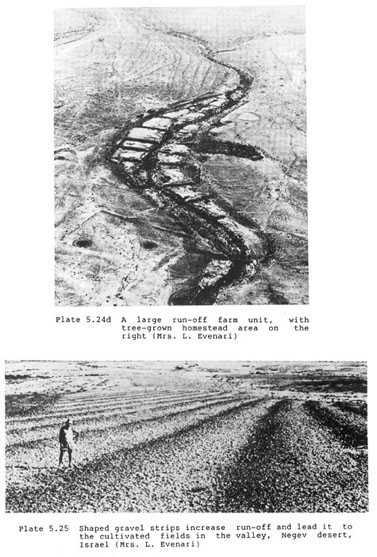 The need to prevent surface run-off is considered by the farmers to override other considerations like soil erosion or conserving moisture, and there results the illogical situation, shown in Plate 5.37, where the traditional open drains have been cut through more recent systems of channel terraces. Another example of surface drainage to solve a particular problem comes from Portugal where the situation is temporary waterlogging at the time of preparing or planting winter cereals. The method is called 'pnudivales' which are small channels constructed after seed-bed prepara- tion and before seeding. They are made with three passes of a tractor. First with a mouldboard plough to create a furrow, followed by two passes with a mounted ridger to produce a shallow open drain between 3 and 4 m wide and 0.25 m deep at the centre. This allows subsequent drilling, cultivating, and harvesting in straight lines ignoring the open channels. These are set out on a gentle gradient of 0.6 to 0.8 percent (Sims 1983). In high latitudes, some or all of the precipitation may fall as snow, particularly in the northern hemisphere, and in semi-arid regions there may be the possibility of increasing the effectiveness of the precipitation by management of the snowfalls. Trapping snow during the winter to increase available moisture in the short summer is a regular practice on the semi-arid steppes of Eastern USSR in Kazakhstan. Some of the first snow is caught by the stubble of the preceding crop, or, in the case of summer fallow, by low lines of mustard planted for the purpose. As soon as 50 or 100 mm of snow has accumulated it is pushed into ridges by heavy-duty tractors with a V-shaped bulldozer on the front and an inward sloping half grader blade on either side, so that the snow is pushed into two windrows or snow ridges one on either side of the tractor. A typical design is 6 m between centres of the ridges with 3 m of untouched snow between. The ridges are up to 1 m high and 3 m wide, and serve as wind breaks to catch more snow between the ridges. In a year of very heavy snow the total snow pack between the ridges can be up to 600 mm but this is more than desirable since the melt water causes erosion problems; 400 mm is normal and more desirable. The conservation bench terraces, described in Section 5.2.3, have the main purpose to hold on the level terraces the run-off from catchment areas on the uphill side. 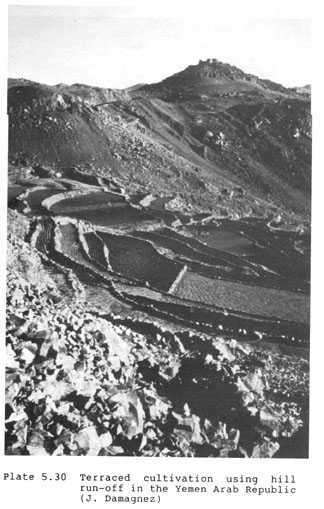 In the two most northern states of the USA where the method was tested, it was found that they also increased the amount of trapped snow, partly as a result of the terraces acting as a physical barrier, and also because of the stubble of the previous summer crop grown on the terraces (Haas and Willis 1968 on North Dakota, and Black 1968 on Montana). Two other methods of snow trapping have also been practised in Montana. 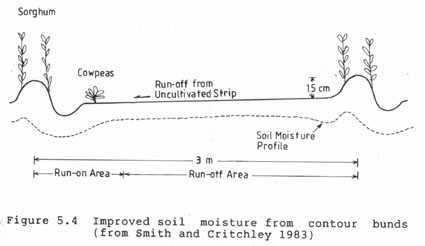 Neff (1980) reports that contour furrows caught snow equivalent to an additional 22 mm of rain, and also reduced the run-off from winter rain and the snow melt in the spring. In eastern Montana, Saulmon (1973) used a standard snow fence (1.25 m high with vertical wooden slats) to trap snow on small catchments which provide surface run-off for small stock watering ponds. The additional depth of snow gave an increase of 100 mm of surface run-off. The extensive literature on dew as a source of water contains many qualitative opinions about its importance or lack of it but few quantita- tive scientific studies. The most detailed study in semi-arid areas is that in the Negev by Evanari et al. (1982). They conclude that the annual total of dew may be significant in comparison with the annual rainfall. An example is a range of 25-35 mm from dew at Avdat where the mean rainfall is 150 mm. The dew formation is considerably more reliable than the rainfall, so that it is possible, as in 1962/63, for the annual dew formation at 28.4 mm to exceed the rainfall at 25.6 mm. This is very much greater than the amounts of dew formation precisely measured in England by Monteith (1957) who found that the average dewfall was from 2-5 mm. However, the desert dew is made up by a large number of very small amounts and not of any consequence as a water supply which can be collected, nor for any higher forms of desert plants, although it is used to some extent by the lower forms like lichens and xerophytic algae. 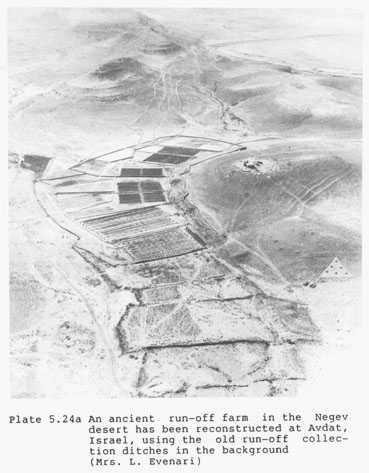 The Negev studies also showed that the piles of stones sometimes previously assumed to be dew collectors for the production of grape vines do not acquire enough dew on the surface of the stones for it to drip off, and that the mounds are in fact for the purpose of increasing surface run-off. There are also reports from China of a long history of growing melons in soil beds covered with a layer of gravel 100-150 mm thick and known as 'gravel fields for melon'. Condensation and dew formation dripping down to the soil is supposed to be the purpose of the gravel but its effect may perhaps be to maintain an even soil temperature or to reduce evaporation. There are a number of examples of artificial collectors, such as plastic sheets being used to collect enough dew to keep alive forest seedlings in the desert in Israel (Gindel 1965), and another use of plastic sheets to produce emergency supplies of drinking water in Australia, but these do not have any agricultural significance. 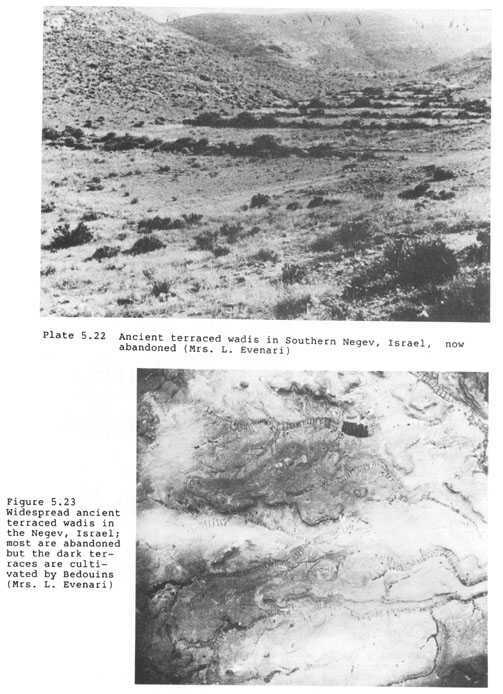 There are also reports of aerial wells which supply drinking water in many dry areas, some with piped supplies, but the studies in the Negev would suggest that the process is more likely to have been the interception and condensation of fog or mist, or direct run-off, than dew formation (UNEP 1983). The story of dew formation and mist condensation is interest- ing, and full of contradictions, but the conclusion has to be that this is not a significant source for water for agriculture.